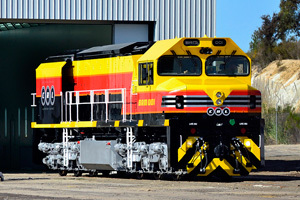 In 2012, SSR’s Bendigo workshop commissioned a brand new state-of-the-art paint facility for the primary purpose of painting locomotives, wagons, passenger cars and rollingstock components. The fully self-contained and temperature controlled paint booth allows SSR to achieve high quality paint finishes in an environmentally friendly process. The addition of a state-of-the-art paint facility was a natural extension of our locomotive maintenance, rollingstock maintenance and wagon manufacturing capabilities. Not only servicing rail freight companies, the paint booth is also suited to painting general engineering products and automotive industry items (such as buses and trucks), providing comprehensive paint services to a wide range of non-rail industries in the area.